Review of Quickspin’s Crystal Queen slot available online. The Crystal Queen slot game from Quickspin has a jackpot of 250 coins available, along with two bonus rounds; ten free spins; and multipliers of between one and five times available for play. Players are able to enjoy the game in both free and real money modes at a good variety of online casinos that support this developer’s software. 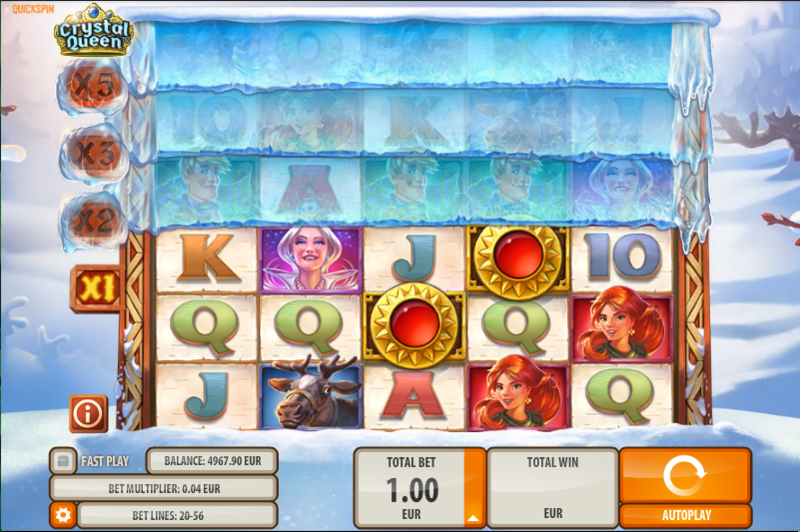 Crystal Queen slot will bring Disney’s Frozen to the mind of those who saw this hit film, presenting this type of animation on the five reels; 56 paylines and up to six rows the game is composed of. There are two wild icons available for play, one of which is termed the spreading wild, rewarding players with up to five extra, adjacent wilds when it lands. The swooping reels feature is also available throughout, allowing players to incur wins during each of their spins, with a multiplier of up to five times applied, as well as extra rows added to play. The free spins bonus feature awards players ten free spins; all 56 paylines activated; six rows enabled and a win both ways element activated to boot. Crystal Queen slot from Quickspin developers takes for its theme Hans Christian Anderson’s Snow Queen, a fairy story centred on the classic struggle between good and evil. Gerda and Kai are the main protagonists, and the game’s imagery is all tied back to this subject. Quickspin has ensured that all players are able to participate in the game as well, having optimised it for mobile devices like smartphones and tablets as well as their more stationary counterparts. The graphics are expertly rendered, and the soundtrack will be very recognisable to Disney film fans, with graphics and animations all in keeping with the theme. The betting range for Crystal Queen slot is between 0.5 and 100 per spin, and the initial 20 paylines are able to increase to 32; 44 and 56, depending on the amount of consecutive wins the player is able to garner. The increase in paylines is thanks to the swooping reels feature. When a winning combination is made, the icons, which contributed to it, disappear, and the empty spaces they leave are filled by the icons above, which drop down and replace them. Each time this happens a new row is revealed, giving the player more paylines to play with. Three consecutive wins will award the player six rows, along with a multiplier that can increase winnings twice; three times; or as much as five times. Alongside this there is a regular wild which is able to appear on the fourth and fifth reels of the base game and the first; second; fourth and fifth reels in the free spins bonus feature. The spreading wild icon for Crystal Queen slot is able to appear on the first; second and third reels in the base game and the second; third and fourth reels during the free spins feature. This adds between one and five extra wild icons randomly alongside the spreading wilds in order to incur larger wins for the player.